In my hometown of Sydney, we’ve had heaps of rain over the past couple of weeks, and in fact it’s raining as I write my guide to indoor trainers. Prolonged wet weather always gets Sydney cyclists talking about using indoor trainers to keep fit. We’re lucky enough to ride all year round in most parts of Australia, but there are plenty of riders around the world who head indoors during their very cold winters. 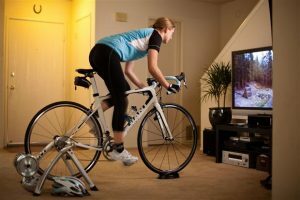 So I thought it would be worthwhile to provide some information about the indoor trainer options, especially with the huge growth in the use of ‘smart’ trainers. A magnetic or “mag” trainer uses a magnetic flywheel to provide resistance. You simply clamp your rear wheel into the trainer and away you go. These trainers are the most affordable on the market and there’s plenty of different models available. Some have adjustable resistance. They can be fairly noisy so aren’t ideal if you live in an apartment. Fluid trainers are a type of magnetic trainer, as they’re based on a magnetic flywheel—but a fluid trainer adds chambers of viscous fluid to further tune the resistance options. They are quieter than magnetic trainers and offer a wide range of resistance adjustment (electronically controlled on the nicer models). Like magnetic trainers they can be fairly hard on rear tyres which rubs against the flywheel. You should consider a spare rear wheel with a dedicated ‘trainer’ tyre if you use it often. Rollers are the oldest of the indoor trainer styles. Here, the bike sits freely on three precision drums inside a frame, which turn as you pedal. Resistance can be provided by the rollers themselves (smaller-diameter drums provide more resistance) or via magnetic, fluid or wind add-on elements. They are popular with track cyclists who carry them to the velodrome to warm up. They are not commonly used as indoor trainers because they take a higher level of skill to master them. These fully featured machines are similar to what you’d see in a high-end spin class studio. They can use fluid or magnetically controlled resistance, and many of them have integrated electronic dashboards and wireless connectivity to interface with apps and training programs. They’re expensive, large, and heavy enough to require a dedicated space. The term ‘smart trainers’ refers to indoor resistance units that can interact with software, so programs like the virtual-riding Zwift control the resistance you feel when pedalling. Most smart trainers work on both ANT+ and Bluetooth. ANT+ is the common wireless protocol for cycling products like heart-rate monitors, and Bluetooth is standard on most newer smartphones, tablets and computers. Besides interactive resistance control, the other main selling point of a smart trainer is power measurement. Like a power meter, a smart trainer will tell you exactly how hard you are working. High end smart trainers like the popular Wahoo KICKR, offer a direct attachment to the rear dropouts; the trainer replaces the bike’s rear wheel. This provides a crisper, more efficient connection between the bike and the trainer because it doesn’t rely on tyre friction to produce resistance, which then also saves tyre life (trainers are very hard on tyres). However, direct-attachment trainers may not work with all drive-trains or axle standards. If you get bored easily (who doesn’t when riding inside?) – Consider a smart trainer that can interface with independent training programs like TrainerRoad or Zwift. What advice have you got to add to the Women Who Cycle guide to indoor trainers? Please respond via comments or the Women Who Cycle Facebook page. Next Post:When should I replace my bicycle helmet? I love using zwift. 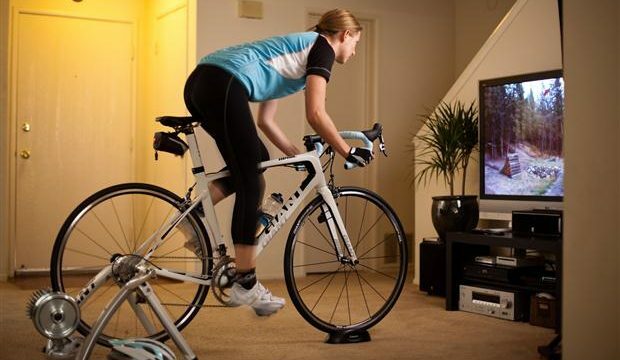 This virtual riding experience makes using an indoor trainer so much more fun. It’s great to be riding around a virtual world with others so you are never riding alone. I use a smart trainer with zwift but have also used a fluid trainer and both work well. Definitely worth trying in horid weather and over winter!